New York: John Day, 1973 Illustrated with photos. Hard Cover. NEAR FINE in a Very Good+ Dustjacket. FIRST EDITION. Dj spine lightly sun faded..
NY: John Day, (1973) Third Printing. Hard Cover. FINE in a FINE DUSTJACKET. Illustrated with photographs. 126 pages, reinforced cloth. 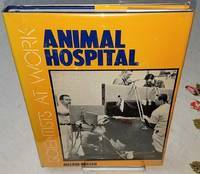 Discusses the work of veterinarians & their assistants in animal hospitals & of researchers in animal medicine..
Harpercollins, 1973-06. Library Binding. Good. John Day Company, Incorporated, 1973. Library Binding. Good. Disclaimer:A copy that has been read, but remains in clean condition. All pages are intact, and the cover is intact. The spine may show signs of wear. Pages can include limited notes and highlighting, and the copy can include previous owner inscriptions. An ex-library book and may have standard library stamps and/or stickers. The dust jacket is missing. At ThriftBooks, our motto is: Read More, Spend Less. Harpercollins, 1973-06-01. Library Binding. Good. Ex library with stamps, light cover wear, tight binding, clean text Prompt, reliable service, shipped next business day. Int'l mailed via first class or priority.